Hey everyone, I hope your week has been going off to a good start…I’m eagerly awaiting Friday! I wanted to tell you about a little project I’ve been working on…Living in the Bay Area, I’m constantly surrounded by technology and innovation whether its a technology project I’m working on at work or talking with friends about their next startup idea. But, I’ve always loved the idea of using technology to connect people with what they love, and in my case–that’s fashion! I’ve teamed up with the global software company SAP and have been working as a member of their Advisory Panel on the creation of one of the newest fashion apps available, My Runway! My Runway was originally released in China and was so popular that it has just been released for the US as well. I’ve spent the past month testing out the app, playing with features, giving my feedback on what’s hot and what needs some work, and I’m really excited that the app is now live and ready for you to try it out too! I wanted to share some of my favorite features with you and hear back what you think of the app. The Brand section allows you to follow all of your favorite brands to stay up to date on the newest trends as well as current sales (my favorite part, ever). You can choose from a list of about 200 brands or even request more if your favorite one is not part of the list yet. The section distinguishes between Favorite and Hot–fave are your own chosen favorite brands, hot are the brands with the highest user followings and are most popular on My Runway. The Trend section is divided into new and hot–you will get the newest items that were added to the brands you are following in New and the hottest trends according to all users of My Runway in Hot. You can set your own filters based on categories, styles and even price ranges to filter on certain trends in this section. 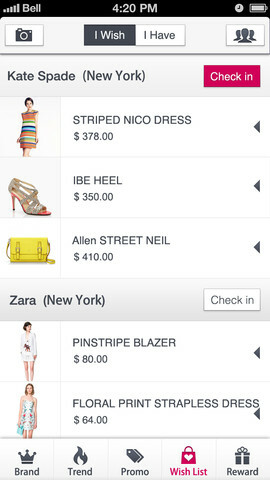 It also lets you put individual items on your Wish List (using the bag with the heart icon). Tapping on an item gives you detailed information like price, colors and sizes available as well as the closest store depending on your current location. My favorite part? You can call the store directly to see if they have your item in stock directly from the app. Where has this app been all my life?!? The Promo section alerts you on all the sales events going on for either the brands you are following or ALL brands. 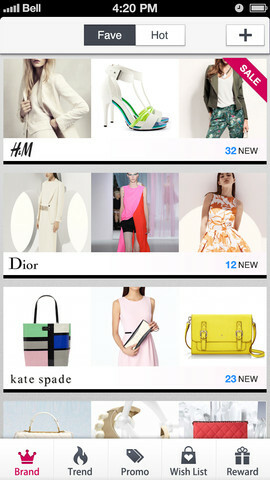 If you let My Runway send you push notifications you will also be alerted about promotions. I like to think of these push notifications as Stop-What-You’re-Doing-There-Is-A-Sale-Going-On notifications. The Wish List section is both your wish list and wardrobe! You can put every item you like on your wish list (using the bag with the heart icon) and share your list on your social media channels. You can indicate whether you want somebody to buy an item for you (maybe for your next birthday, wink wink) or share that you have just bought it yourself! Leaving a comment on your recent purchases gives other app users ideas of what the item is actually like (fabric, quality, etc). You can of course also take your own pictures of items you just bought or already have in your closet directly from the app. And last, the Reward section is not only your profile page but also keeps track of your status level and points earned. 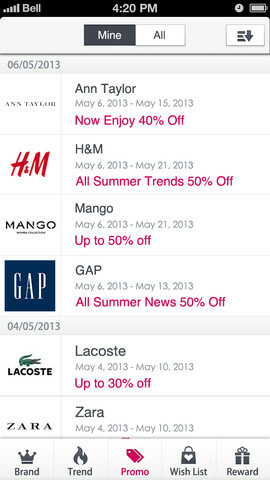 Check-in on the app at various stores and you earn points towards promotional deals and discounts for the brand. You can also search users and invite friends from here as well! So that’s a summary of My Runway! It was JUST released to the public this past week (available on the Apple App Store as well as on Android’s Google Play) so I’m looking for people to follow on it so that I can start seeing where everyone is shopping and see what pieces you are styling. Have you guys downloaded My Runway yet? Let’s follow each other (I’m signed up as @JustAddGlam) and I’d love to hear what you think! Congrats on working with SAP! That’s a huge opportunity. Looking forward to the app. What an insightful article! Congrats on your latest activity with My Runway! It’s actually a great summary of all the features of the app!! I’ve recently started bookmarking things with the app’s MyWish bookmarklet, which can be very useful for your Wish List section!!! Thanks so much for this blog post, it is really nice! It is also updated frequently as more brands are added. Thanks Jennifer, and see you at one of our next events!